Casey McDaniel had never been so nervous in his life. In just ten minutes, The Meeting, as it would forever be known, would begin.? Casey had every reason to believe that his performance over the next two hours would determine the fate of his career, his financial future, and the company he had built from scratch. ?How could my life have unraveled so quickly?? he wondered. In his latest page-turning work of business fiction, best-selling author Patrick Lencioni provides readers with another powerful and thought-provoking book, this one centered around a cure for the most painful yet underestimated problem of modern business: bad meetings.? And what he suggests is both simple and revolutionary. Casey McDaniel, the founder and CEO of Yip Software, is in the midst of a problem he created, but one he doesn?t know how to solve.? And he doesn?t know where or who to turn to for advice.? His staff can?t help him; they?re as dumbfounded as he is by their tortuous meetings. Then an unlikely advisor, Will Peterson, enters Casey?s world.? When he proposes an unconventional, even radical, approach to solving the meeting problem, Casey is just desperate enough to listen. As in his other books, Lencioni provides a framework for his groundbreaking model, and makes it applicable to the real world.? 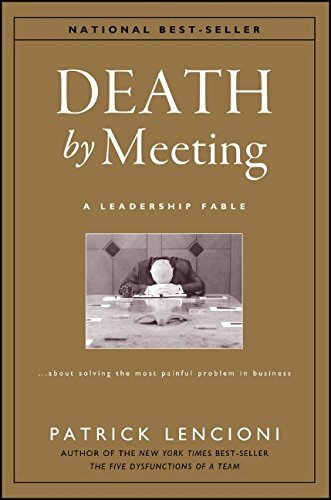 Death by Meeting is nothing short of a blueprint for leaders who want to eliminate waste and frustration among their teams, and create environments of engagement and passion.